All transactions are safe and secure with a reliable history in online purchasing behind each of our associates. Buy the Kazakhstan Flag Borat shirt to own Borat clothing and merchandise. Show your love for Kazakhstan with this blue flag Kazakhstan Borat t-shirt. 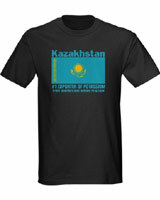 The front of the tee features the country's flag with the statement, "Kazakhstan - #1 Exporter of Potassium. Other Countries Have Inferior Potassium" printed in blue text. The design is featured on various forms of apparel, including ringer Ts, sweatshirts, tank tops, and Borat hats. Show your love for the country that fictitiously gave birth to the now famous Sacha Baron Cohen character. In addition to the Kazakhstan Flag Borat tee above, browse the Borat Clothing Gallery for more apparel like men's and women's clothes, kids shirts or hoodies.